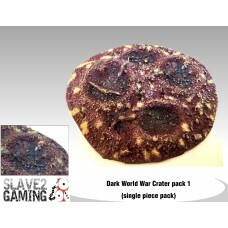 Looking for some unique 18mm resin terrain to fill out your Dark World War games? Check out our unique range, now with added fallen soldiers. These Barbed wire fences are roughly 120mm long and 40mm wide. What you get:2 Barbed wire fence bases (one left and the other right)12 wooden poles Barbed wire - 145mm of.. This ruined trench is roughly 130mm by 65mm (at its widest).What you get:1 resin cast ruined trench .. This resin crater is roughly 115mm diameter.What you get:1 resin cast large Crater .. 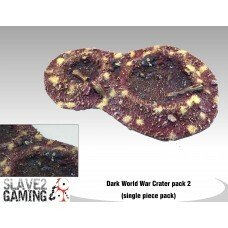 This resin crater set is roughly 120mm by 80mm (at its widest).What you get:1 resin cast Crater .. 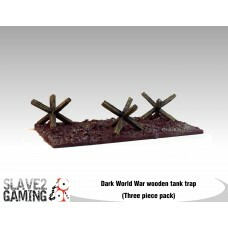 These tank traps come without the base.What you get:3 metal cast Cross piece 6 metal cast diagonal piece.. If you are after a special Unique order of any of our figures, we do happily offer this type of order. These can be an order from one figure to multiples of a single figure that you like.However..